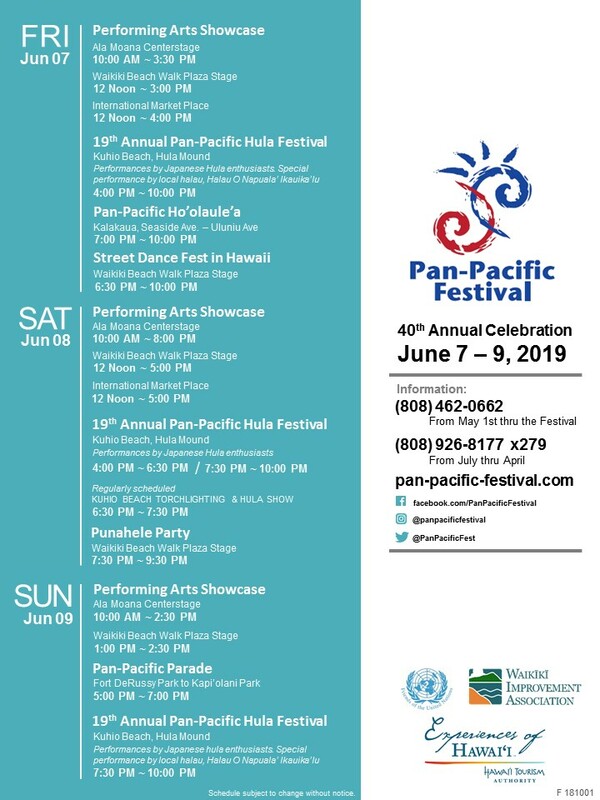 As the Hawaiian sun sets on Waikiki Beach on Sunday, the Pan-Pacific Festival culminates with a grand finale – the Pan-Pacific Parade! Colorful performers, dynamic drummers, and ethnic cultural groups from around the world all march down Kalakaua Avenue in a spirited procession. It begins at Fort DeRussy Park, at the top of Waikiki, and finishes at Kapi’olani Park which is at the other end of Waikiki. Spectators gather along the length of Kalakaua Avenue, some bringing folding chairs or mats to sit on, to watch hundreds of performers from Hawaii and around the world, march or ride in convertible cars as they participate in this vibrant Parade! Okinawan performers, high school marching bands, taiko drummers, steel pan musicians, hula dancers, ukulele strummers, cheerleaders, lion-dragon dancers, sparkling flag twirlers, Korean traditional performers, and beauty queens; each year brings different performers, but they are always spirited and enthusiastic as they strut their stuff in this pageantry of color! There are two emcee stands from where each parade participant is introduced – one at the start of the parade, near Fort DeRussy Park, and one at the main viewing stand, fronting the Moana Surfrider Hotel. Enjoy taiko drums, singing, and dancing as the pre-shows open up the last event of the weekend! Take pleasure in the warmth of the late afternoon sun and cool trade winds as you enjoy the colorful sights and sounds of the grand Pan-Pacific Parade!